These unique double-hung windows with their handsomely divided top pane let in any amount of breeze you want, or button up against a winter storm. The traditional frames, with their crown moldings, repeat the lines of the fireplace mantel. 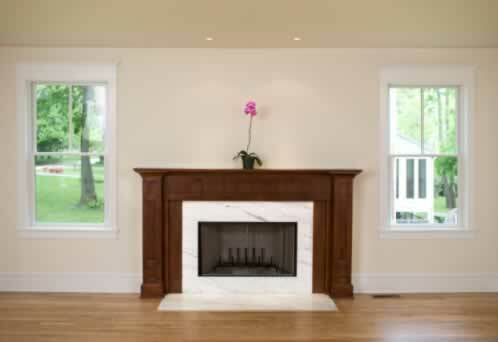 In return, the marble hearth and fireplace insert surround compliment the window frames. The outdoor scenes through both windows are woodsy, and the rich wood face of the fireplace again creates visual harmony, as do the wood floors. The fireplace is placed to screen out all but the back porch of the neighboring building, so the windows can be wide open for sunlight and still afford privacy. This arrangement of a classic fireplace with adjoining windows is so typically American that it's easy to forget the underlying excellent design. This photo is the view from the sofa. Put your feet up and enjoy!